Onomatopoeias are great. They are one of my favorite parts about language. 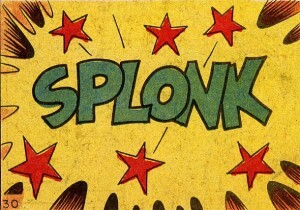 As a person who uses a lot of sound effects in my daily life, onomatopoeias fill me with great joy. They are so expressive, and in the comic/visual arts world, they are incredibly important. (At least I think so.) They can bring a sense of liveliness to a conversation. They are the hand jive of the English language. And everybody likes to do the hand jive, right? Onomatopoeia |ˌänəˌmatəˈpēə, -ˌmätə-| Noun: the formation of a word from a sound associated with what is named (e.g. cuckoo, sizzle). The use of such words for rhetorical effect. ORGIN: late 16th century, Latin/Greek. Onomatopoeia ‘word-making’ from onoma, onomat- ‘name’ + -poios ‘making’ (from poiein ‘to make’). Pretty cool, right? 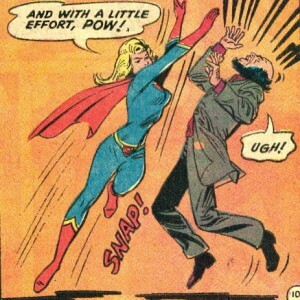 So why do onomatopoeias matter? Without them we wouldn’t have great words like zing, crackle, hiss, ooze, slither, snooze, and a whole host of SQ words: squish, squawk, squeak, and many, many more. From a comic point of view, onomatopoeias are priceless. They bring a visual element that enhances the storytelling. What was a fine picture can be enhanced by a sound descriptor. We can really picture the scene and everything that’s happening in it. Think of your favorite onomatopoeias and use them in casual conversation. It could be a great way to find a new friend. Or amuse the old ones you already have. This entry was posted in Grammar Grit and tagged definitions, English, grammar advice, onomatopoeia on April 8, 2013 by Dylan Benito.